Even if you're a card-carrying canine fanatic, if your neighbor’s dog views your yard as an integral part of his territory, you might be a lot less than delighted by his constant visits. Free roaming canines can disturb your own pets, frighten away the local wildlife, drop unwanted "gifts" on your lawn, and worst of all, put themselves in harm's way. Of course, the dog is your neighbor’s responsibility, not yours, so the first step is to speak to your neighbor, politely asking her to make sure her dog doesn't have free roam of the neighborhood. 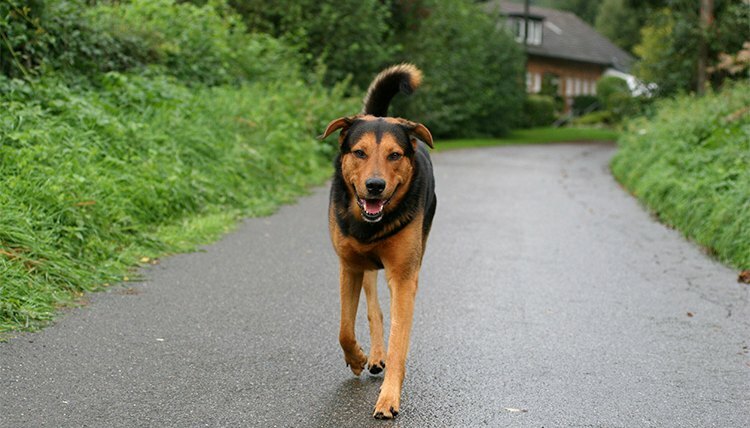 In the meantime, there are a few tricks to humanely discourage other dogs from trespassing. Some of these suggestions will also keep away wild canines such as coyotes and foxes. Tip #1 - Take photographs, both of the dog entering your yard and of the messes he leaves behind. These may come in useful later on if you need to prove to your neighbor that the dog was entering your property. Tip #2 - Remove the dog messes with a plastic scoop and bucket and hose the area clean to remove the smell. A lingering scent of his own waste suggests to a dog that this is an appropriate spot to do his personal business. Some actually advocate giving the bucket of feces to your neighbor, but we don't advise this! An angry confrontation with an aggressive neighbor may ruin any chance to reach an amicable solution to the dog problem. It is generally a better tactic to securely dispose of the waste yourself. Tip #3 - Remove items that might be encouraging neighborhood dogs to visit your yard, such as food for your own pets or uncovered trash. If you have pets, especially smaller animals such as guinea pigs, cats or rabbits, bring them inside, and if applicable, supervise their outdoor excursions. Tip #4 - Make some noise by rattling a few coins in a can or banging a pot with a serving spoon to startle your neighbor's dog when he crosses into your territory. If startled often enough, he should associate your yard with these unpleasant noises and keep away. Tip #5 - Distribute animal repellents, such as cayenne pepper or commercial preparations, around the perimeter of your yard. Repellents for coyotes or foxes should also be unpleasant to pet dogs. Tip #6 - Install a motion sensitive sprinkler and test it to make sure that it goes off when something the size of a dog goes past. This may startle the dog enough to make him go elsewhere.